Completing the correct forms for my wife. I know this question has been asked many times, and it might sound like a broken record. I just really need to know for sure on what I should do. I just recently got married in Vietnam. I've just arrived back into the states and I really just need to know what should I do to bring my wife to the US. Now, I've heard many conflicting information from people being able to come to the states from 4 months to a year. What is it that I have to do here to get things rolling to get my wife here. And what does my wife have do through the process while in Vietnam. Thanks much for anyone that can help. I've just been in a battle with my the in-laws as to why I haven't hired anyone to do this for me. From what I'm told, this should be a breeze when completing the paper work. 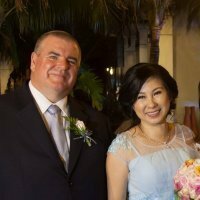 2) We received our Marriage Certificate on 8/31/12 in Vietnam. You need to start off by sending an I-130 petition to USCIS. This is to petition your spouse for an IR-1/CR-1 visa. Once the I-130 is approved (will take around 5 months), your case will then head to NVC where two fees are paid and two more packages are sent in. Once your case is complete there, it'll be sent to Vietnam. Your spouse will need to take a medical and then attend the interview. Thanks Saylin so very much. During the phase when you were doing the paper work with your husband, did he ever have to certify or notarize any of the documents submitted? Just something that I haven't seen mention of anywhere. Only asking because my wife and I had to notarize nearly every form for our wedding certificate. Just want to be safe then sorry. We never notarized anything. We did have to send certified copies of certificates though. For I-130, photocopies of certificates are fine, but when at NVC, it has to be originals/certified copies. No forms can be faxed, it has to be mailed. Where did you see proof of residence was needed? It was from the link you gave me earlier on. Also what should be used for Bonafide Marriage evidence? Is there were I send like plane tickets, photos, etc? 1. Payment as required by USCIS. Use a personal check if allowed by the Service Center (as of 4/2005 they do allow this). If not, use a money order so you can track the payment. 2. Cover Letter. Should include a description of what your are petitioning for (I-130), a table of contents (list everything in the packet). If you need additional room to explain your case, attach a separate sheet (list the attachment on the cover sheet). Make sure to sign and date the cover sheet. 4. Copy of the full Birth certificate (front and back) for the US Citizen or a copy of ALL pages of the US Citizen's passport. This is used to establish citizenship. 9. If either you or your spouse were previously married, submit copies of documents showing that all prior marriages were legally terminated (court certified copies of the petitioner's and/or intending immigrant's divorce documents). 11. G-325A filled out by the US Citizen, signed and dated. 12. One passport-type photo (see specification) of the petitioner. Write the full name on the back. Place in a plastic bag and label the bag "Photo of <Insert Name>". Attach the bag to a sheet of paper and place behind the corresponding G-325a. 13. G-325A filled out by the non-US Citzen spouse signed and dated. 14. One passport-type photo (see specification) of the non-US Citzen spouse. Write the full name of the beneficiary on the back. Place in a plastic bag and label the bag "Photo of (insert name) ". Attach the bag to a sheet of paper and place behind the corresponding G-325a. It would be wise for you to do some reading in the Vietnam regional forum before submitting your petition. The HCMC consulate is one of the tougher places to get a family based visa. There are some nuances that others have not experienced. The link below is to the Vietnam sub forum. The reason I gave it is because Vietnam is high on fraud (fiance/spouse only wants a GC) so the embassy/consulate is very skeptical of K1s or people seeking spousal visas (what you're doing for your wife). Your documents may be in order but other things (red flags) like: if you don't work, age, if you guys are college students, Co sponsor, type of wedding, size of wedding, who was at the wedding, cohabiting before marriage etc may affect (hinder or slow down) your attempt to get your wife to the US. Search VJ or the subforum for red flags in Vietnam and if you have any more questions or problems, post your question(s) there. If you're referring to number 6, it doesn't apply to you as you said you're a citizen, thus not a permanent resident.